In Finland apprenticeship is an alternative way to the school based VET to achieve vocational qualifications and it is an effective tool of adult education and further education as there are no age limits for apprenticeships in Finland. Also further vocational qualifications and specialist qualifications can be achieved through apprenticeships training. Mobility of Finnish apprentices is mainly individual exchanges, as the apprenticeships also are mainly individually tailor-made due to the adult age and prior skills of the apprentices and the high salary level in the Finnish apprenticeship system. The first award took place in Turku on the 9th of October by Turku apprenticeship office. The label was awarded to a joinery company Tammipuu, which had hosted a French apprentice in Turku in Spring 2013. Turku apprenticeship office has participated Leonardo da Vinci mobility projects for apprentices since 2010 as a part of a network of apprenticeship bureau. In 2013 they sent 9 and hosted 10 apprentices. 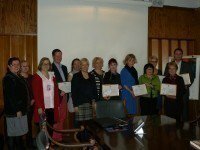 On the 17th of December seven other organizations were awarded in Helsinki by the Helsinki apprenticeship office. Four of them had hosted altogether 11 apprentices or VET students from Austria, Germany and UK in 2013. K-Supermarket Hertta hosted three retail apprentices from Austria, electricity company Johtomiehet Oy hosted two electricity apprentices from Germany and Kustaankartano service centre for elderly hosted six social care VET students from UK. Also following City of Helsinki organisations were awarded a label for sending their apprentices abroad for one month work exchange; Early childhood care department for sending three child care apprentices to UK and Germany, City Library for sending three apprentices to Denmark, Netherlands and Spain, Social and health department for sending five practical nurse apprentices to Ireland, Netherlands and UK, as well as STARA Engineering Workshop for sending two joinery apprentices to France.